Deep atmospheric moisture, associated with the remnants of "Harvey," is forecast to lift northeastward into Middle Tennessee from mid to late week. As of right now, it looks like the majority of the rain will fall between Wednesday and Friday night, although at least scattered showers and thunderstorms will probably continue into Saturday and Sunday as well. 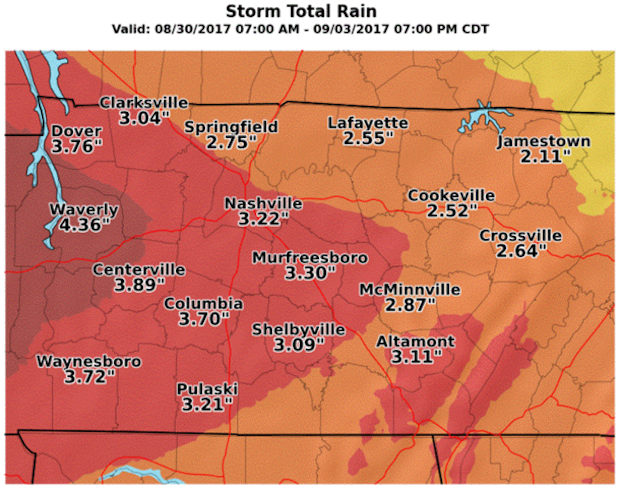 Rainfall totals from 7am Wednesday through 7pm Sunday here in Rutherford County and much of the mid-state are forecast to be mainly between two and four inches, although locally higher amounts are possible-- especially over western areas. Grounds will become increasingly moist with each passing round of showers and storms, and ponding and localized flooding may become an issue as we head into at least the first part of this upcoming holiday weekend. Stay with the NewsRadio WGNS Weather Eye team of meteorologists who are continually updating the forecast to keep you informed.